'Thou Art That': Listen to Feb..
MTSU 2019 Pleas Faculty Award .. 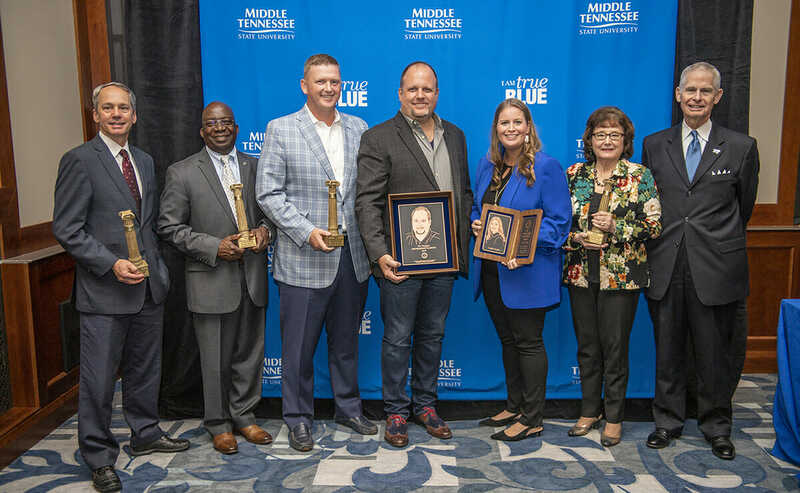 The MTSU National Alumni Association is now accepting nominations for the 2019-20 Distinguished Alumni Awards. The awards, which will include an overall Distinguished Alumni recipient and Young Alumni Achievement honoree, recognize those with prolonged records of achievement who have made outstanding contributions to society and who exemplify the ideals for which MTSU stands in extraordinary ways. This year marks the sixth year for the expanded awards, which include True Blue Citations of Distinction. People are encouraged to nominate someone online for an award. Criteria and nomination forms can be found at www.mtalumni.com/awards. Nominations for all awards are due on or before Friday, March 29. Recipients, who will be selected in late summer, will have a celebration in their honor during MTSU Homecoming Week this fall and will be recognized at the Homecoming Parade and football game. The dates for Homecoming Week are still being finalized. • Achievement in Education — MTSU Faculty. • Achievement in Education — Non-MTSU Faculty. The annual recognition also includes the David Cullum Award for Service to the University, named for the former president of MTSU’s National Alumni Association, Blue Raider Athletic Association and MTSU Foundation, who died in May 2013. He was a member of the Class of 1955. Anyone with questions about the form or process can contact the Office of Alumni Relations by calling 615-898-2922 or 800-533-6878, or email Michelle Stepp, Alumni Relations associate director, at Michelle.Stepp@mtsu.edu.